Note that this feature is still in beta. It likely has some bugs, so if you notice anything strange, please let me know. You can now import sync your ConnectWise contacts with Simplesat. To access, go to your Integrations page, then click Sync ConnectWise contacts. If you've already authenticated with ConnectWise through your survey, you don't need to do it again. Just click Enable Customer Sync to start the import. Once that's active, we'll sync data every 24 hours. Head over to the Surveys settings and create a new survey. You'll notice there's an NPS option in the creation modal. 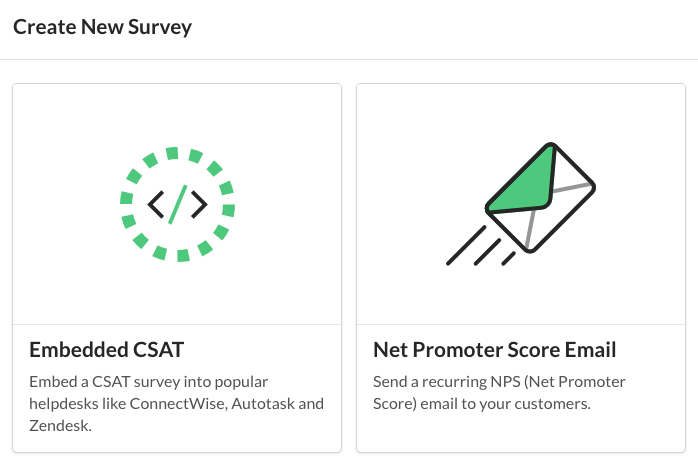 Choose Net Promoter Score Email. This is the same as your CSAT survey landing page settings. Instead of getting an embed code like your CSAT survey, here's where you can customize the email that gets sent out. You can preview the email and by clicking the Send Test Email button. You can click a rating from the email to preview the survey. Note: clicking a link from the email will add a rating to your account. You can delete the tests. If you'd like the "From" email address to contain your sending domain, let me know. I can add that to our SendGrid account and provide you the with the necessary DNS entries to add. We'll eventually have this option through the UI. First, you can create the "audience" that you'd like to receive your quarterly emails. To do so, add a rule and enter the value that should match. 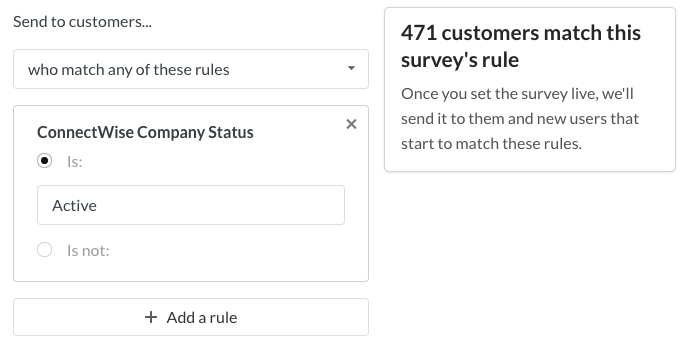 For example, the rule below creates an audience for all customers who match Company Status = Active. As you edit the rules, the list size will populate in real time to give you an idea if it's working or not. If you want to confirm the exact contacts in an audience you've created, let me know and I can get it from the backend and provide it for you. Choose how frequently a contact should get the emails. Choose the days of the week and time of day we should send emails. Note that time zone is hardcoded to UTC at the moment. You have two options here, either spread out evenly over the frequency you've set, or send immediately. If you choose to spread out over time, Simplesat will automatically calculate how many emails are sent each day based on the list size, frequency and delivery window. After the survey is live, Simplesat will take care of all the automatic email sending. As new ConnectWise contacts are added to your account, or data changes, we'll sync that info and automatically update your audience rules. So it should truly be on autopilot. Our ConnectWise contact sync is currently limited to maximum 1000 contacts. If you have more than that in your system it will work, but only import the first 1000. We'll fix this soon. If an audience rule isn't working, let me know and I can help look up what the fields are through the API to make sure we're adding the correct text. I've activated the NPS settings in your account through a feature toggle. Other users in your account won't be able to access yet. If they want to, let me know and I can enable. I'd love to hear your feedback, good or bad. Let me know what you like or what's confusing. This is our first pass at the feature, so a lot we have to to do improve. If you'd like me to give you a demo walkthrough of this, please schedule a time here https://calendly.com/corybrown. I'd love to work with you.